Key Difference: AMOLED is a type of screen used in consumer electronics, such as smartphones, tablets, and laptops. Gorilla Glass is a type of protection that is used on the screen. Consumer electronics, such as smartphones, tablets, and laptops, are very popular these days. In fact, these products comprise of a multi-billion dollar industry. These products also don’t come cheap; hence, consumers want the best for their buck and something that lasts. There are many electronic gadgets available on the market. These products have to vie for the consumer’s attention. One of the ways it does this is through providing high end components, such as the best screens. There are many different types of screens available, such as TFT LCD, IPS-LCD, Resistive Touchscreen LCD, OLED, AMOLED, Super AMOLED, etc. Each of these types has something that helps them stand apart from the others. AMOLED stands for Active-Matrix Organic Light-Emitting Diode or "Active Matrix OLED" for short. It is a hybrid display technology that combines the active matrix backplane from a traditional TFT display with an OLED display. The advantage of this is that it has a faster pixel switching response time than the traditional OLED displays. Currently, AMOLED is very popular for use in mobile phones, media players and digital cameras. However, it is not currently popular for use in larger applications such as televisions or laptops. AMOLED screen have been made popular by phone manufactures, such as Samsung, who tout its benefits. Samsung uses what it calls a Super AMOLED display in its popular Samsung Galaxy line of phones. 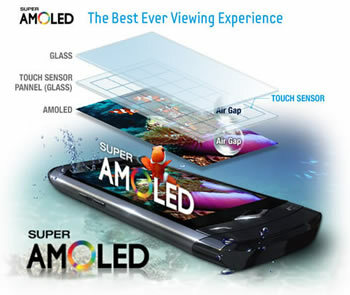 Super AMOLED is essentially an AMOLED display that Samsung has integrated it with a digitizer, which means that the layer that detects touch is integrated into the screen, rather than overlaid on top of it. As compared to other screens on the market, AMOLED has a faster pixel switching response than traditional OLED displays, consumes less power and has better contrast ratios than LCDs. However, AMOLED displays may be difficult to view in direct sunlight as they have reduced brightness. Also organic materials used in AMOLED displays are very prone to degradation, which may result is fading of one color over the others. As anyone with a cracked screen knows, displays are very easy to damage. Hence, it is essential that the companies that charge so much for their product provide some form of protection on their screens. This is where Gorilla Glass comes in. Gorilla Glass is an alkali-aluminosilicate sheet toughened glass. It is scratch resistant as well as impact resistant, which means that it will protect the display of the device against the accidental scratches made with keys in the pocket or accidentally dropping the phone. Displays are very delicate and are often covered with a glass sheet to protect it. However, glass was likely to crack, shatter or break. This was motivation for companies to try to come up with a toughened glass that would be more resistant to breakage. The result was Gorilla Glass. 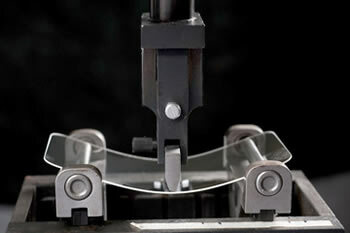 Gorilla Glass was developed and is manufactured by Corning Inc. It was developed from a chemically strengthened glass called "Chemcor" that Corning developed in the 1960’s. Today, Gorilla Glass is used primarily for portable electronic devices, including mobile phones, portable media players, portable computer displays, and some television screens. The main difference between Gorilla Glass and AMOLED is the fact that AMOLED is a type of display used in electronics, whereas Gorilla Glass is a type of toughened glass that acts as a screen protection, usually laid on top of the display such as AMOLED. No specific company. It is an industry standard. A display technology for use in mobile devices and televisions.